Hershey’s long-anticipated Cookie Layer Crunch bars are now available at mass retailers across the country. Hershey is celebrating the nationwide rollout by giving away one million samples at local Walmart’s (participating locations found here)! Beginning January 27, Hershey fans can take a complimentary bite of Cookie Layer Crunch at a number of Walmart locations in your area. Cookie Layer Crunch is the latest innovation from Hershey’s – it delivers a fun and delicious surprise by combining the classic Hershey’s Chocolate that consumers love with the crunch they desire. Every Hershey’s Cookie Layer Crunch bar contains layers of crunchy cookie bits and decadent filling, all surrounded by smooth and creamy Hershey’s Chocolate. 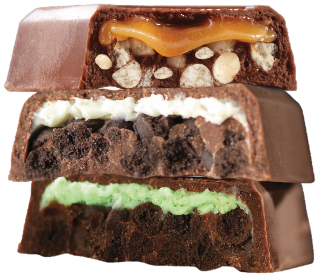 Hershey’s Cookie Layer Crunch bars will come in three delicious flavor varieties: Caramel, Vanilla Crème and Mint. Be on the lookout to join the one million sample taste-test celebration by keeping an eye out for sampling experiences in-store at your local Walmart.